Random Scribbles: At what age do you start running? I have heard that doctors say that before you start any serious exercise schedule and if you are over 30, you should get a complete medical checkup. Well, thats allright. But I want to know what tests or precautions they recommend for someone who plans to take up a career in running at the age of 81! Profession before age 81: Farmer in Punjab India. Profession after age 81: Running! 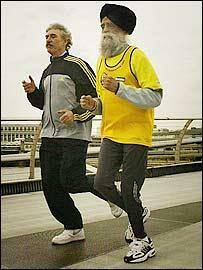 Presently: at age 94, he is still running and has ran several marathons in the UK, US, and Canada. Saturday, 2 July 2005 he will attempt running several lengths of track to make various records.